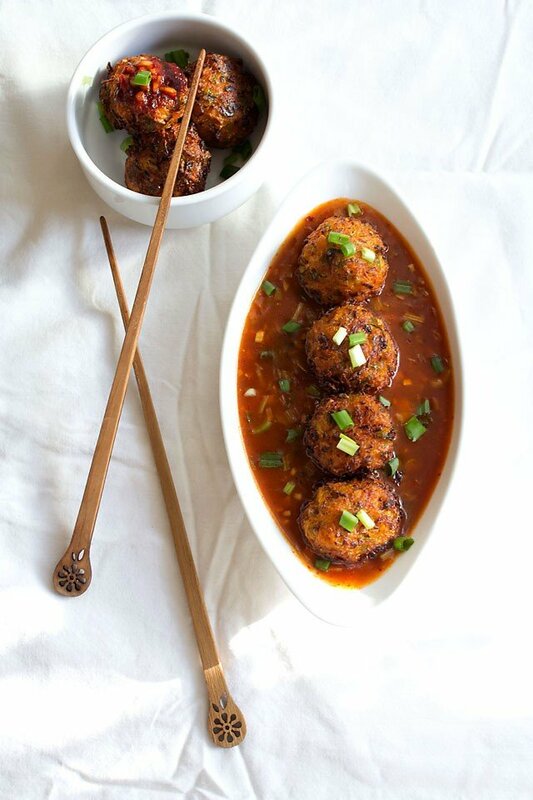 baby corn manchurian gravy is a spicy, sweet and sour gravy that tastes great with veg fried rice or veg noodles. baby corn manchurian gravy recipe with step by step pics. 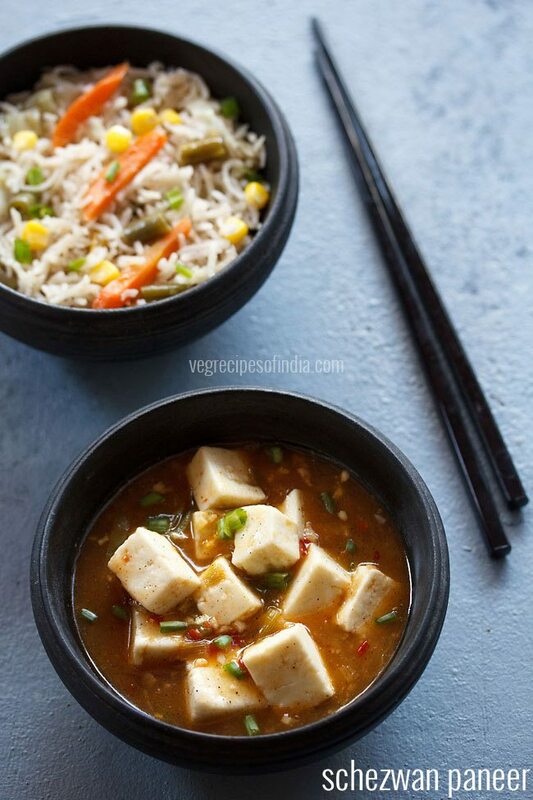 baby corn manchurian gravy is a spicy, sweet and sour gravy that tastes great with veg fried rice or veg noodles or hakka noodles. 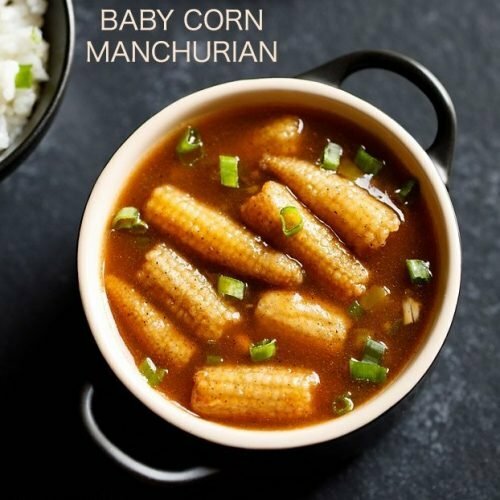 i have also shared a starter snack of crispy baby corn manchurian recipe before. 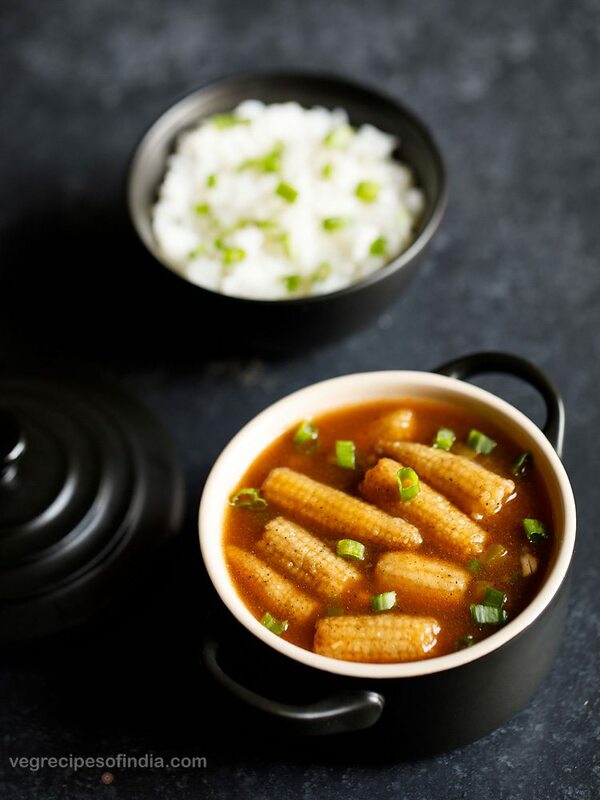 in this baby corn manchurian gravy recipe you can shallow fry or deep fry baby corn. sometimes i pan fry them also. for this recipe post to save time, i have deep fried them. in the recipe you can add less or more of the sauces as per your requirements. 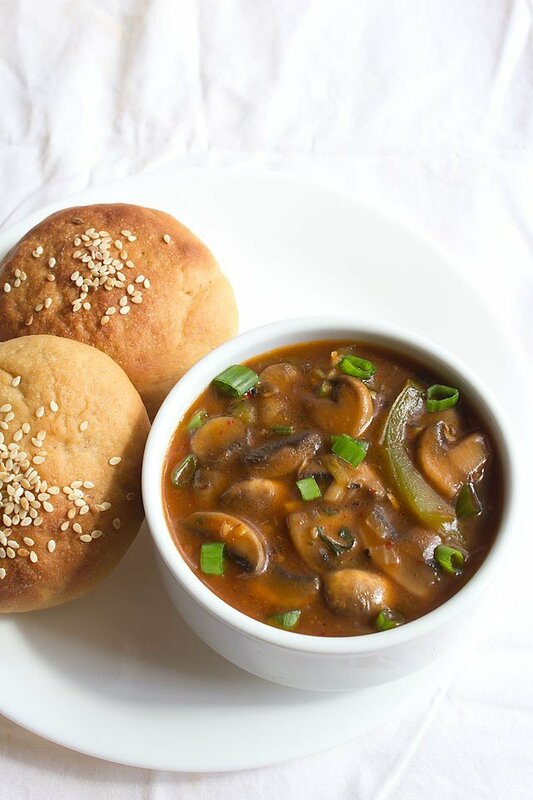 there are four manchurian gravy recipes that i have already shared. 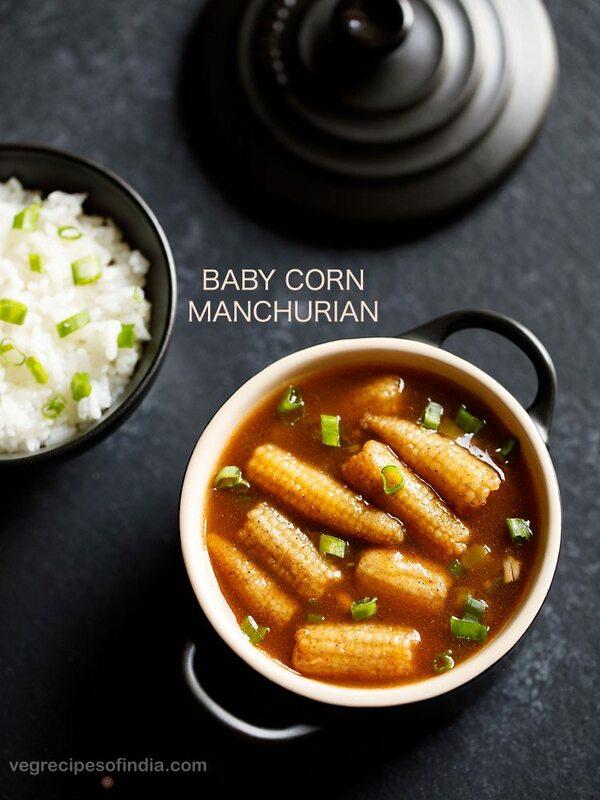 baby corn manchurian can be served with a rice dish like veg fried rice or burnt garlic fried rice or 5 spice rice or jeera rice or even plain steamed rice. rinse and then chop 250 grams baby corn in 2 to 3 pieces. if they are small in size then no need to chop them. or add as per taste. then add 2 tablespoons corn flour (corn starch). mix very well. heat oil as required in a kadai or pan. you can deep fry or shallow fry. 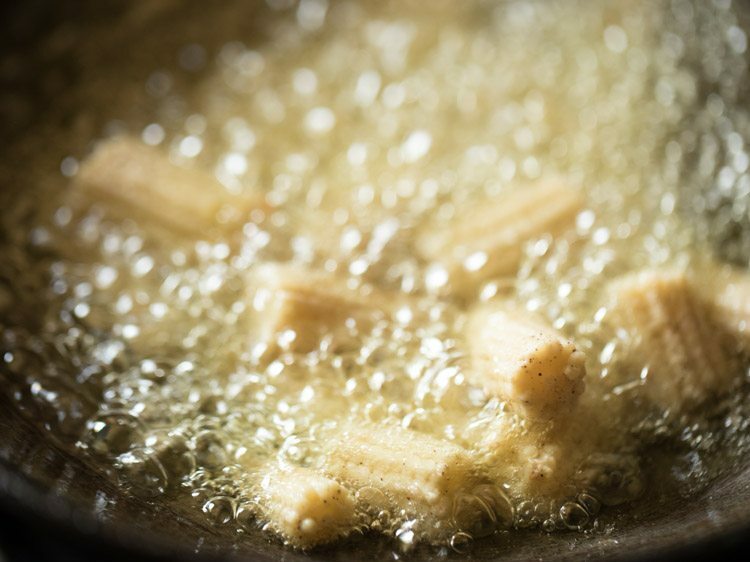 check the oil temperature by adding one piece of baby corn. it should gradually come on top. then the oil is ready for frying. if it stays at the bottom the oil is not hot enough, so increase the flame. if it comes up too quickly, the oil has become very hot, so reduce the flame. 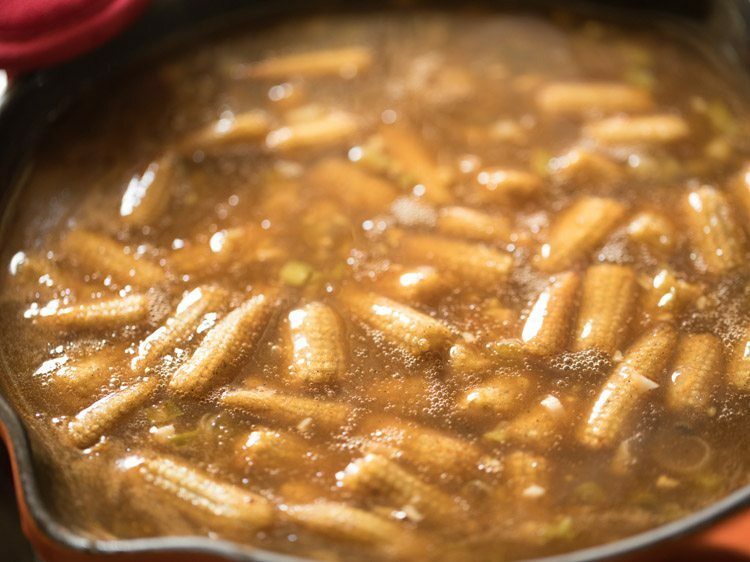 add the baby corn pieces. begin to fry at medium flame. when one side is crisp and light golden turn over and fry the second side. 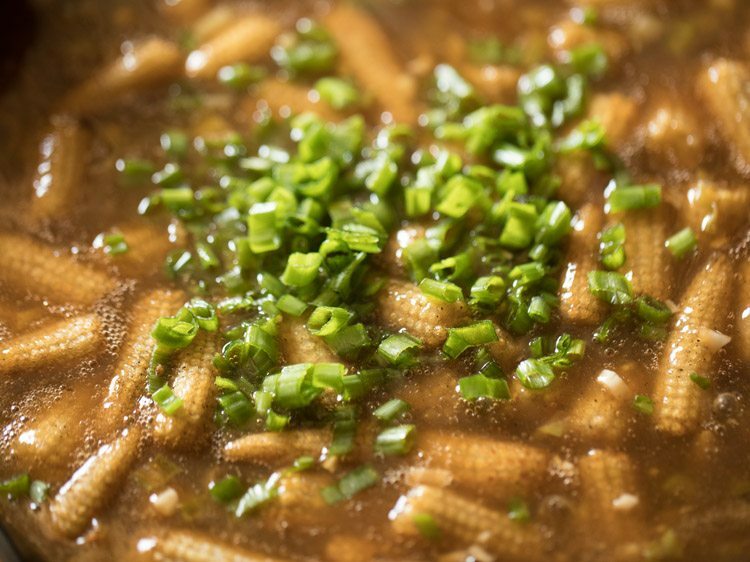 flip a couple of times and fry till the baby corn pieces become golden and crisp. remove with a slotted spoon. place them on kitchen paper towels. continue to fry this way in batches. 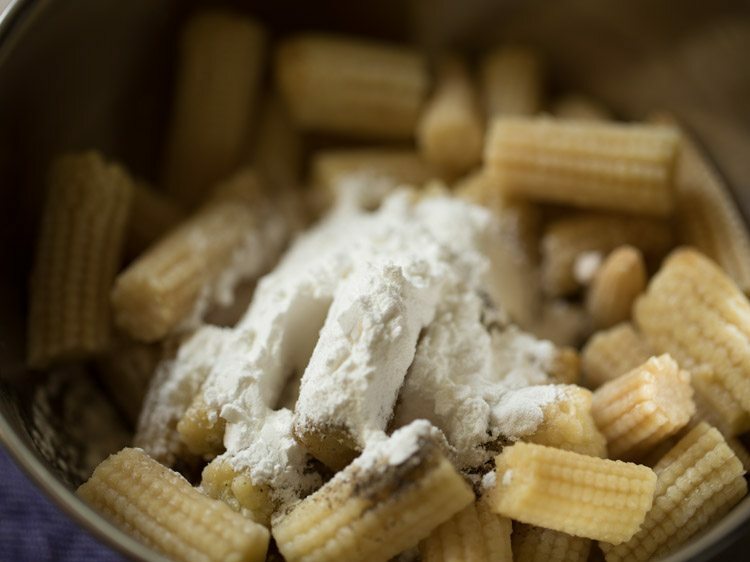 in a small bowl take 2 tablespoons corn flour (corn starch). 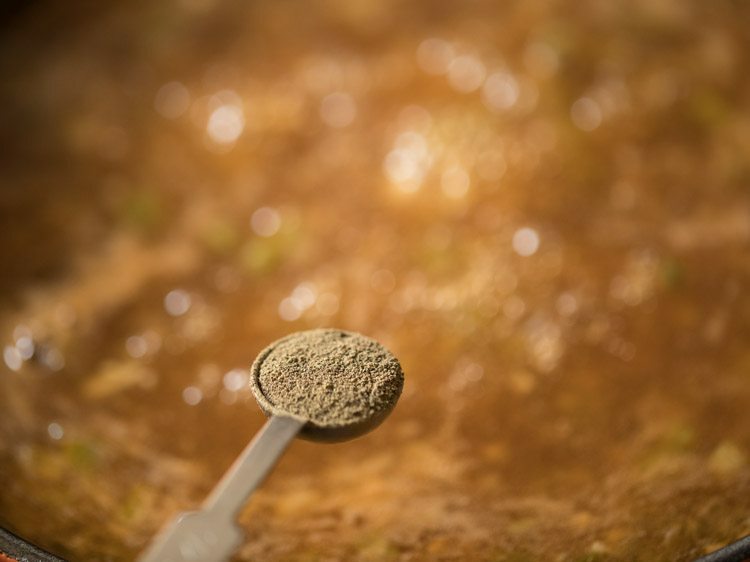 mix very well to form a smooth paste. keep aside. in another pan heat 2 tablespoons oil (sesame or peanut or sunflower oil). then add 1 teaspoon finely chopped ginger, 2 teaspoons finely chopped garlic and 1 teaspoon finely chopped green chilies. 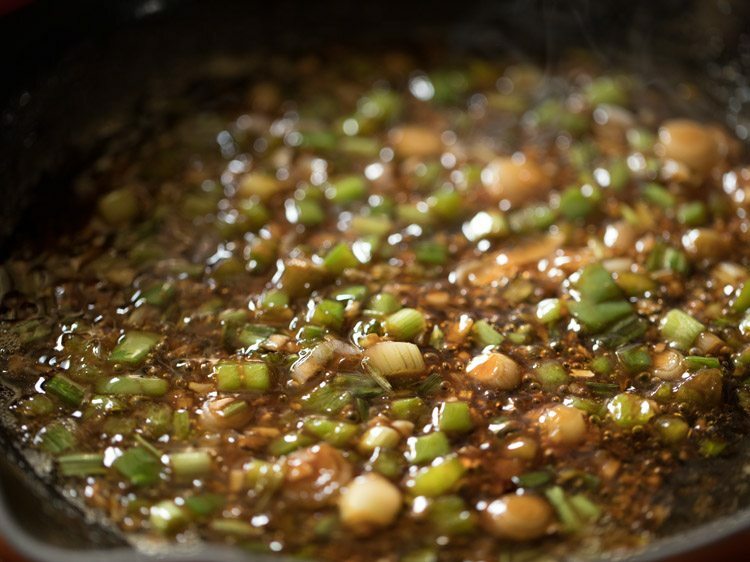 saute for one minute on a low flame or till the raw aroma of both ginger and garlic goes away. 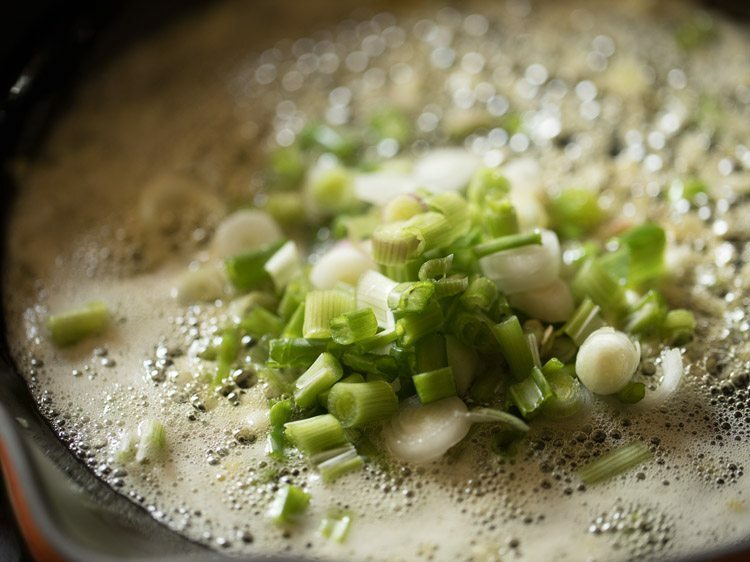 next add ⅓ cup chopped spring onions. stir fry on medium to high flame for 1 minute. 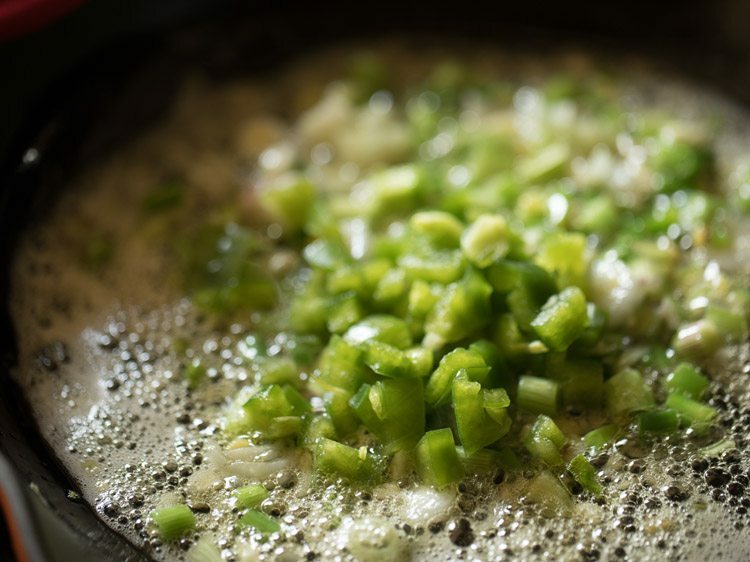 then add ¼ cup finely chopped capsicum (green bell pepper). mix very well. stir fry on medium to high flame for 2 minutes. 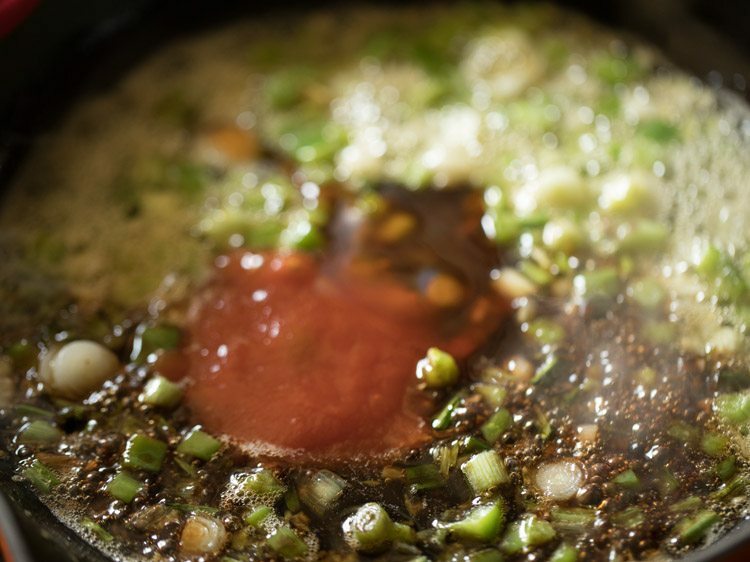 reduce the flame and then add 2 tablespoons tomato ketchup, 1 tablespoon soy sauce, ½ tablespoon red chili sauce or sweet red chili sauce or sriracha sauce. add 2 cups water. 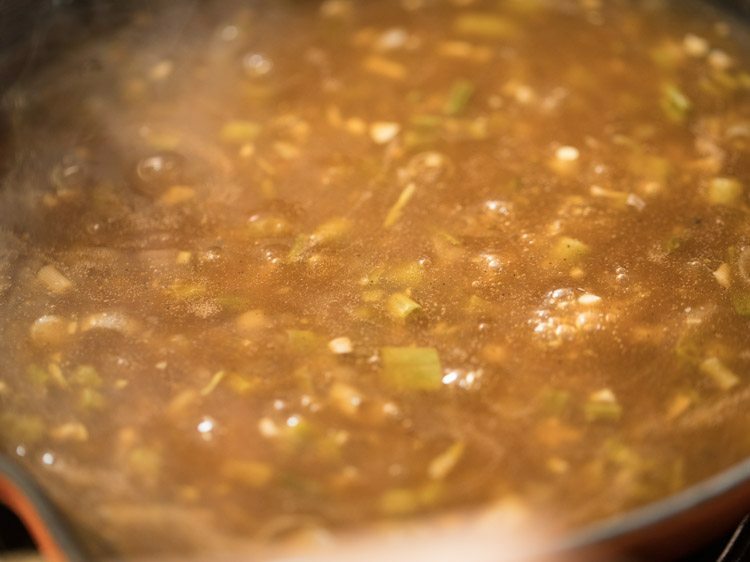 for a thick baby corn manchurian gravy or sauce you can add less water. mix well and simmer on a medium to high flame. reduce the flame. then add the corn starch paste. stir the paste and then add. as the corn starch settles down at the bottom of the bowl. as soon as you add corn starch paste mix very well. in case you see lumps, then using a wired whisk stir and mix. stirring with wired whisk helps in breaking the lumps. 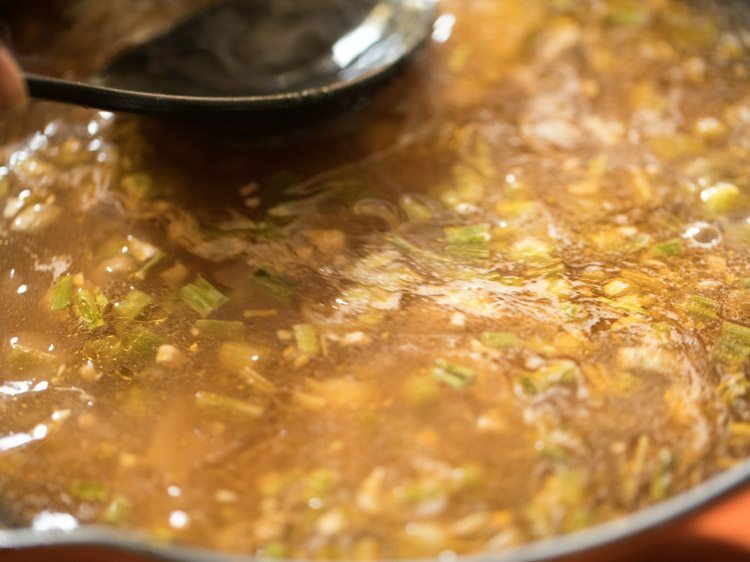 simmer on medium to high flame for 3 to 4 minutes. 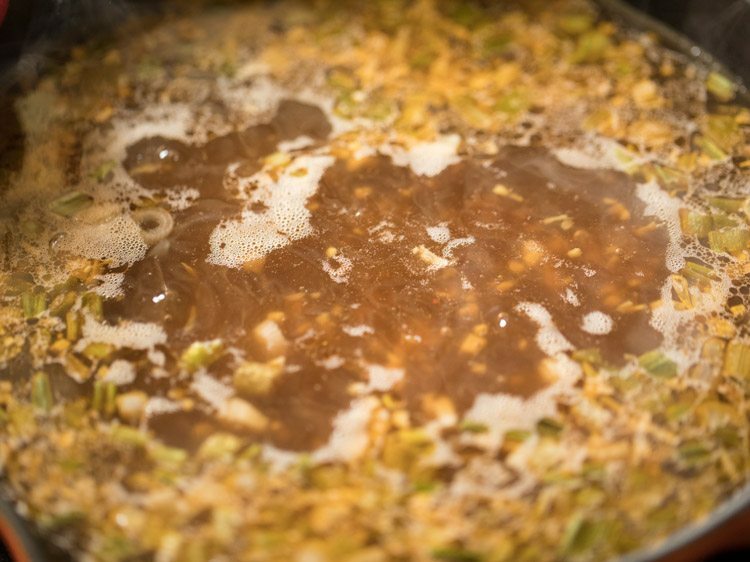 the sauce or gravy will also begin to thicken. 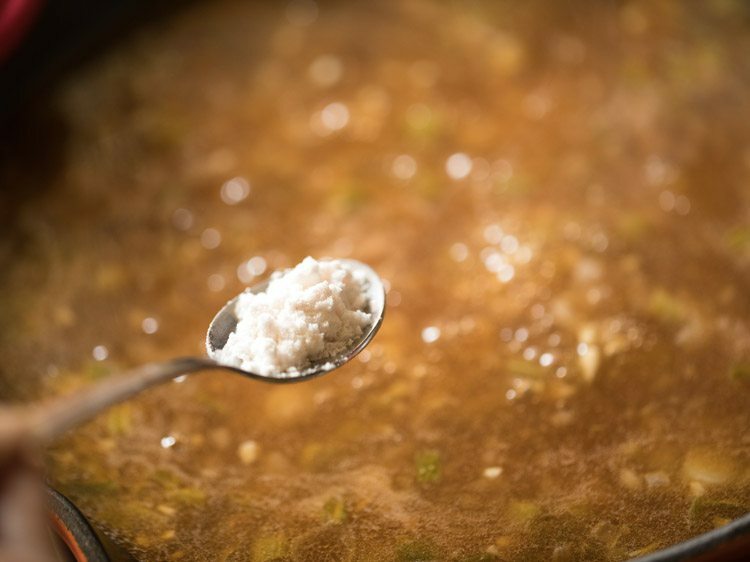 then add salt as per taste, ¼ teaspoon black pepper powder and ½ teaspoon sugar. mix very well. check the taste and add more salt, pepper, sugar or any of the sauces if required. 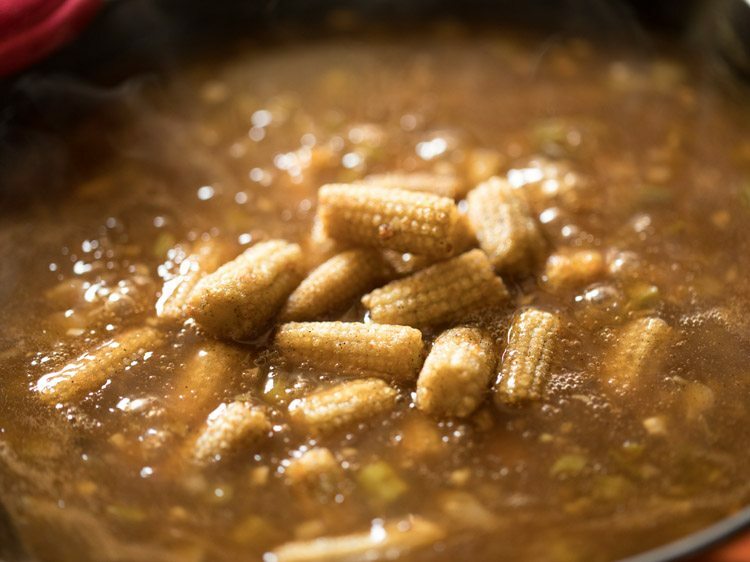 add the fried baby corn and mix again. switch off the flame and add ¼ cup chopped spring onion greens. 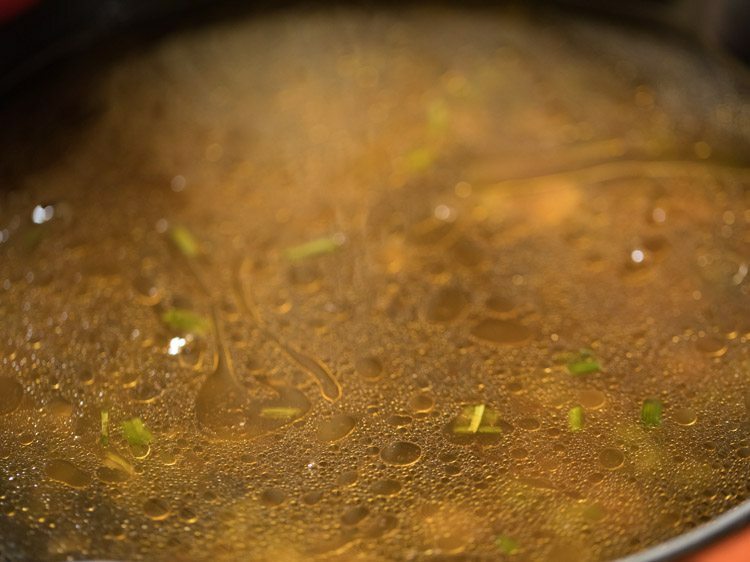 lastly add ½ teaspoon rice vinegar or white vinegar or apple cider vinegar. mix well. 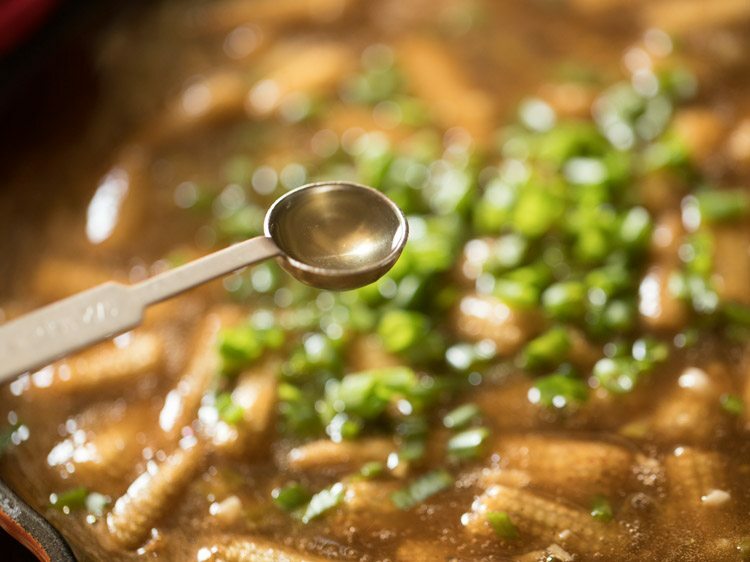 garnish baby corn manchurian gravy with some chopped spring onions while serving. 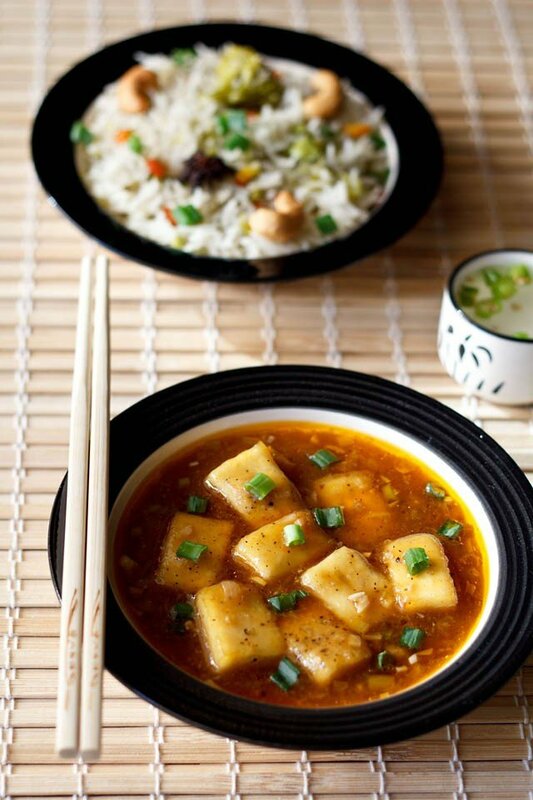 serve baby corn manchurian with veg fried rice, burnt garlic fried rice, veg noodles or plain steamed rice. you can also serve with chapatis or phulkas. 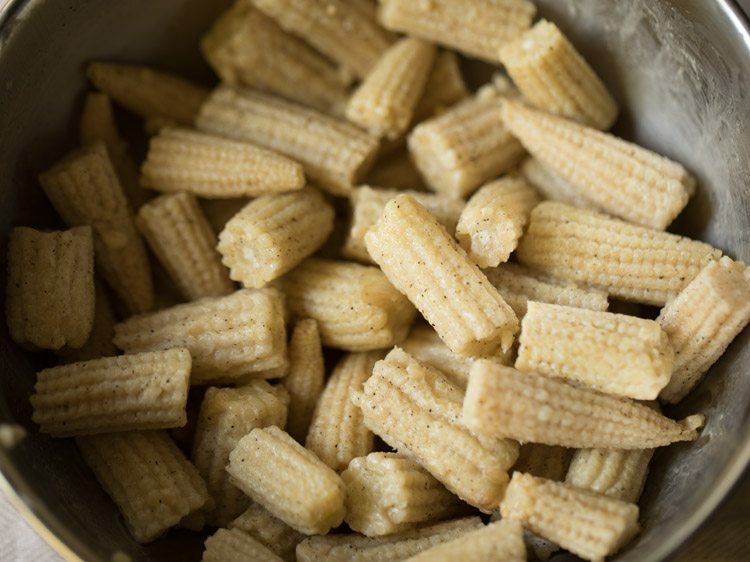 1. rinse and then chop 250 grams baby corn in 2 to 3 pieces. if they are small in size then no need to chop them. 3. then add 2 tablespoons corn flour (corn starch). 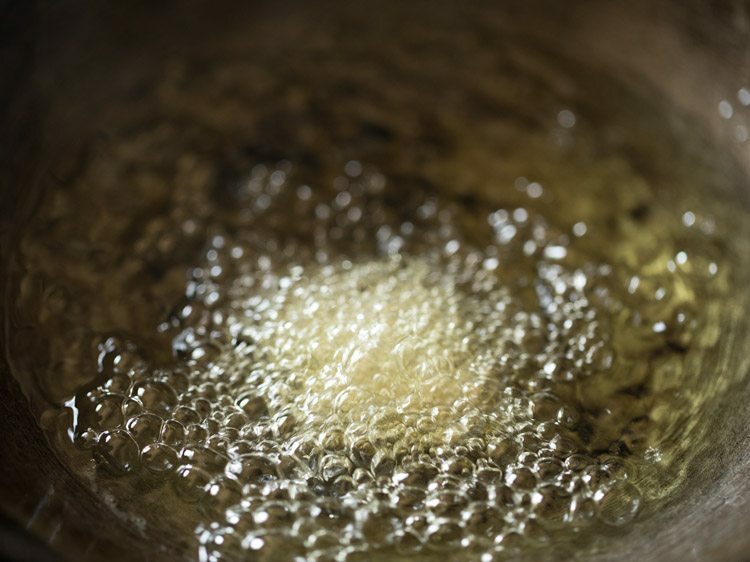 5. heat oil as required in a kadai or pan. 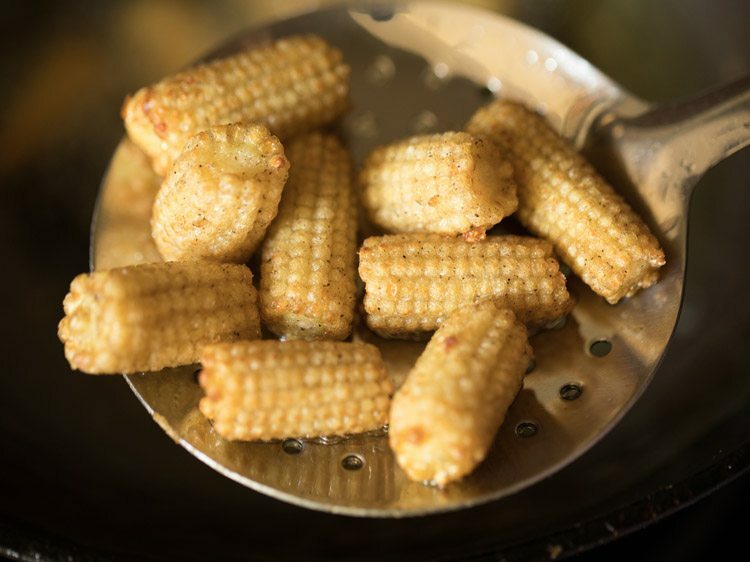 you can deep fry or shallow fry the baby corn. check the oil temperature by adding one piece of baby corn. it should gradually come on top. then the oil is ready for frying. if it stays at the bottom the oil is not hot enough, so increase the flame. if it comes up too quickly, the oil has become very hot, so reduce the flame. 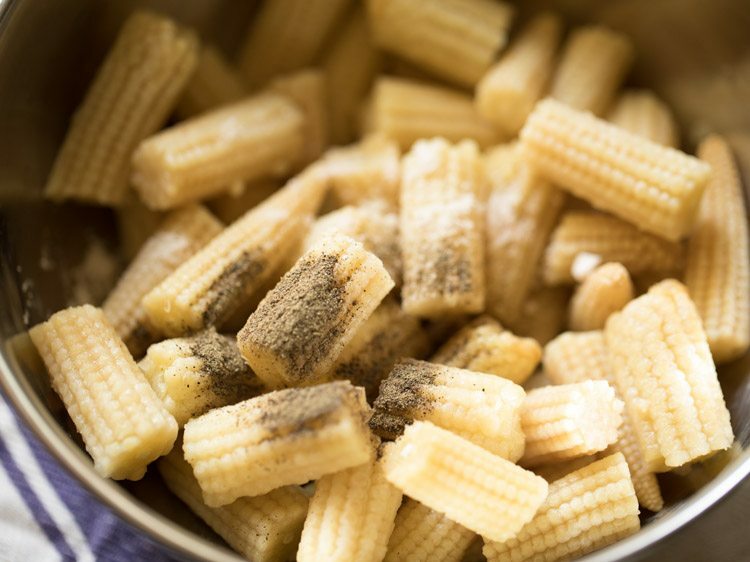 6. add the baby corn pieces. 7. begin to fry at medium flame. when one side is crisp and light golden, turn over and fry the second side. 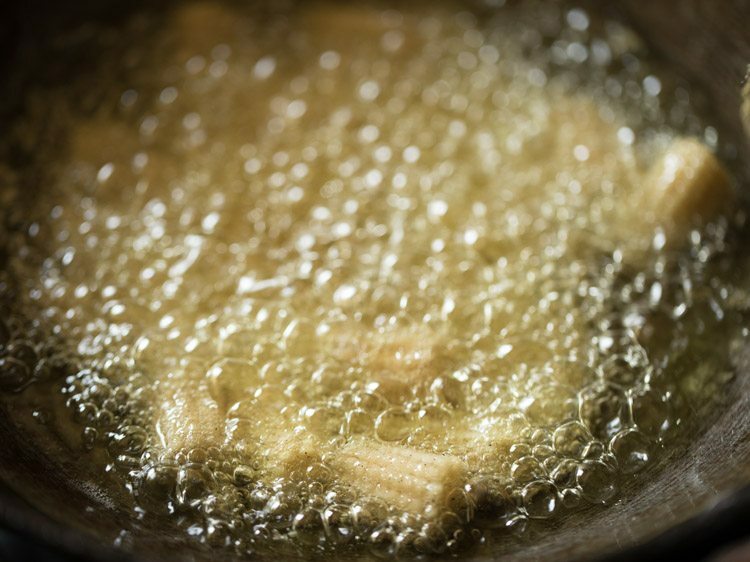 8. flip a couple of times and fry till the baby corn pieces become golden and crisp. 9. remove with a slotted spoon. 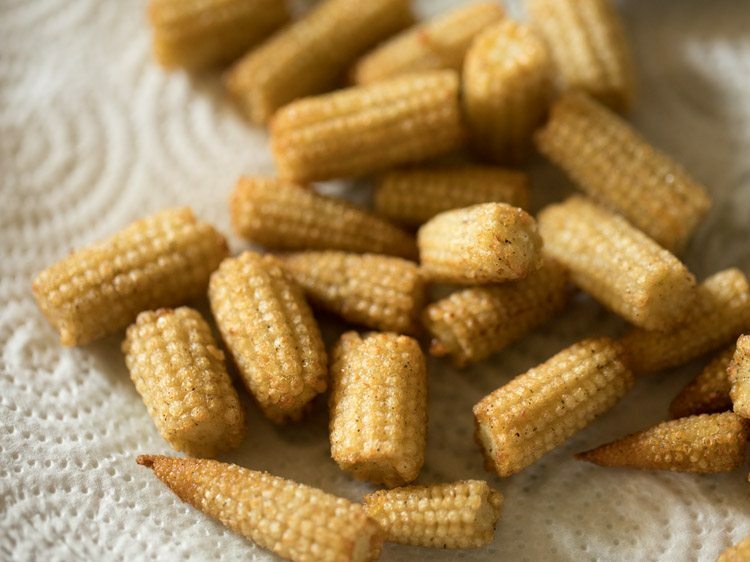 10. place fried baby corn on kitchen paper towels. continue to fry this way in batches. 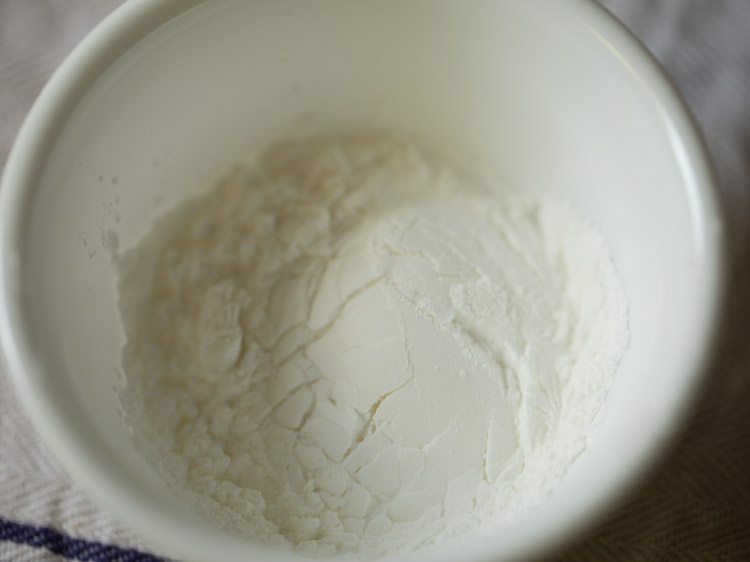 11. in a small bowl take 2 tablespoons corn flour (corn starch). 12. add 2 tablespoon water. 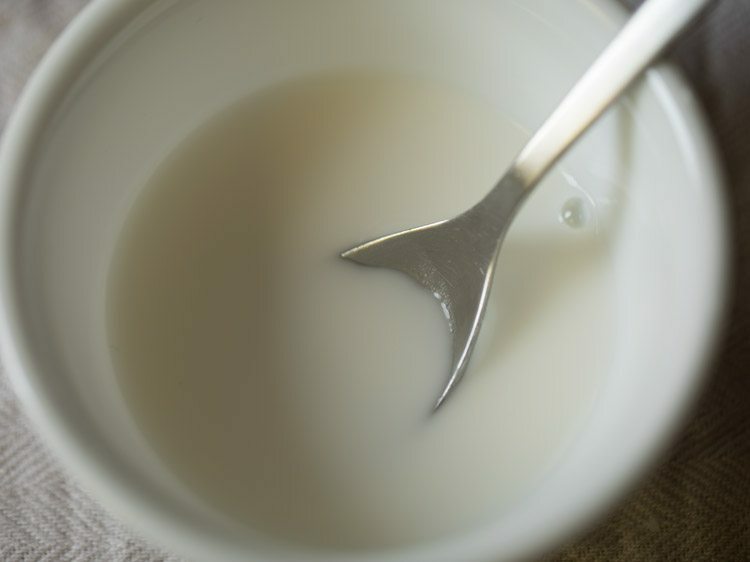 13. mix very well to form a smooth paste. keep aside. 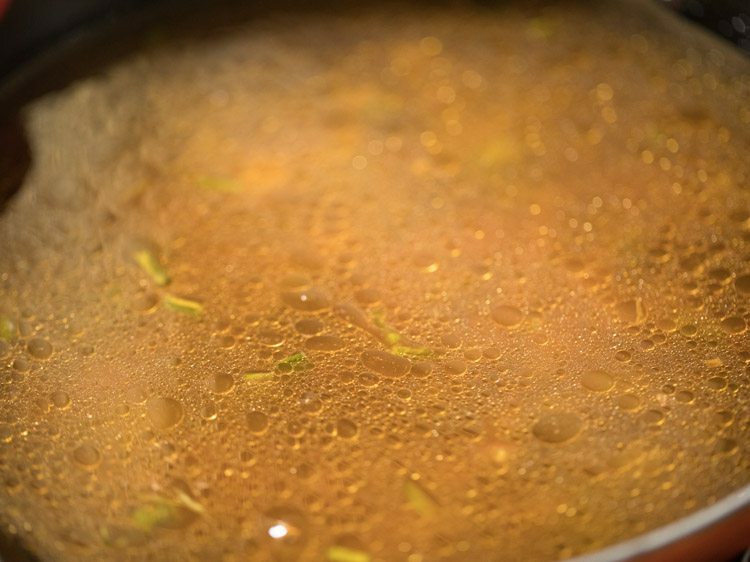 14. in another pan heat 2 tablespoons oil (sesame or peanut or sunflower oil). then add 1 teaspoon finely chopped ginger, 2 teaspoons finely chopped garlic and 1 teaspoon finely chopped green chilies. 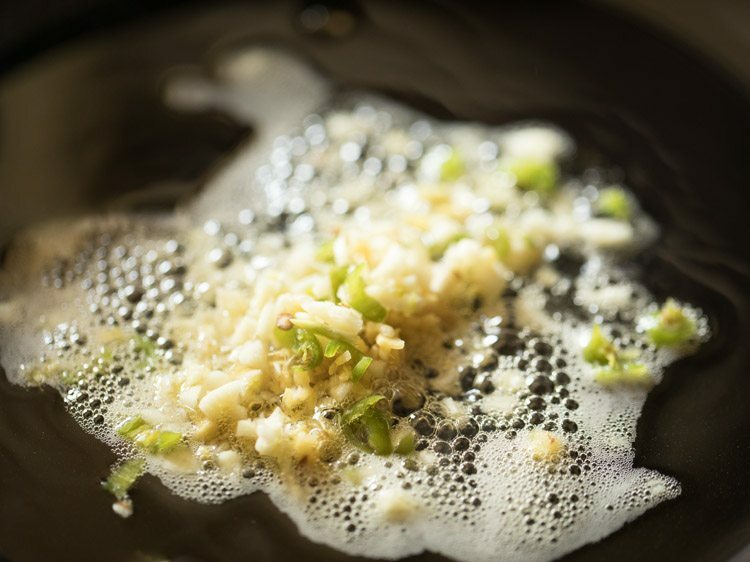 15. saute for one minute on a low flame or till the raw aroma of both ginger and garlic goes away. 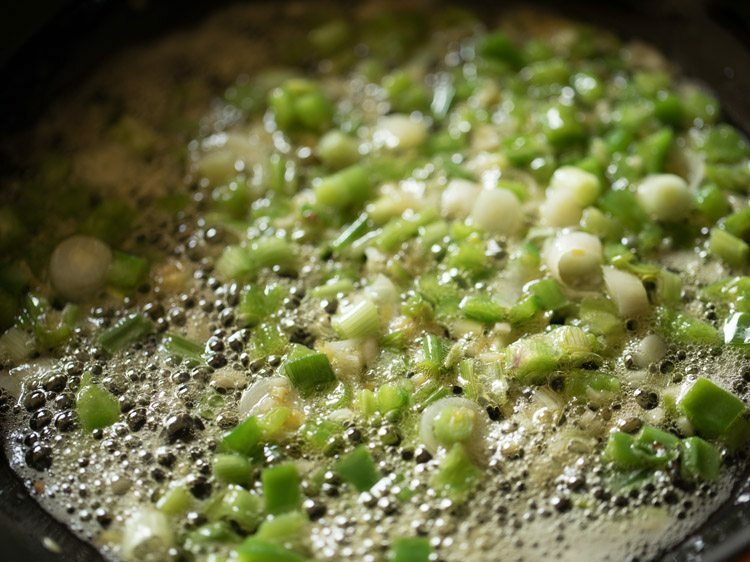 16. next add ⅓ cup chopped spring onions. 17. stir fry on medium to high flame for 1 minute. 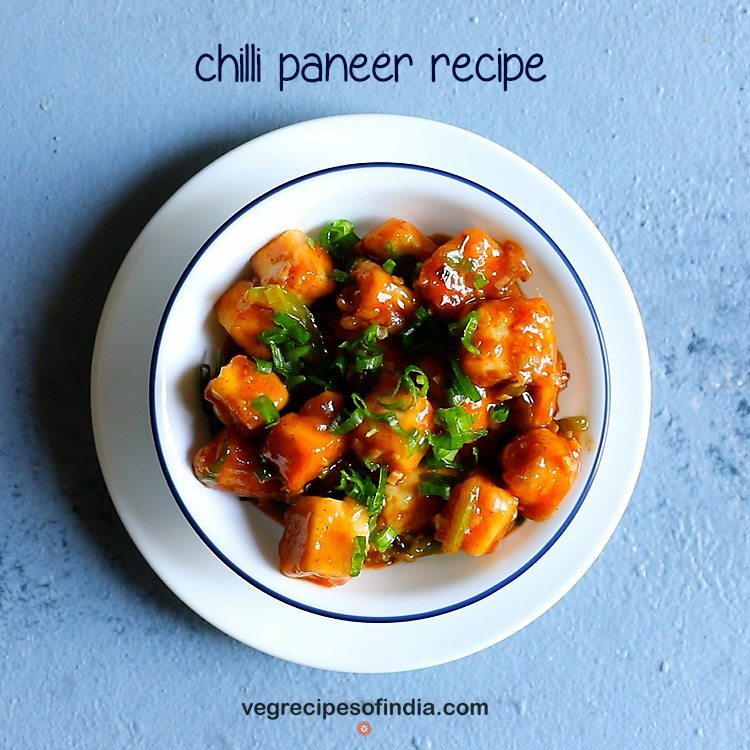 18. then add ¼ cup finely chopped capsicum (shimla mirch or green bell pepper). 20. stir fry on medium to high flame for 2 minutes. 21. reduce the flame and then add 2 tablespoons tomato ketchup, 1 tablespoon soy sauce and ½ tablespoon red chili sauce (or sweet red chili sauce or sriracha sauce). 23. add 2 cups water. for a thick baby corn manchurian gravy or sauce you can add less water. 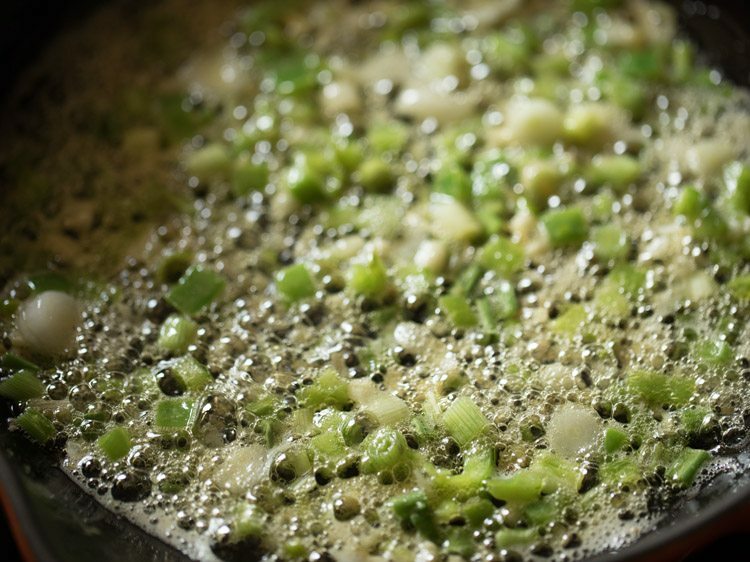 24. mix very well and simmer on a medium to high flame. 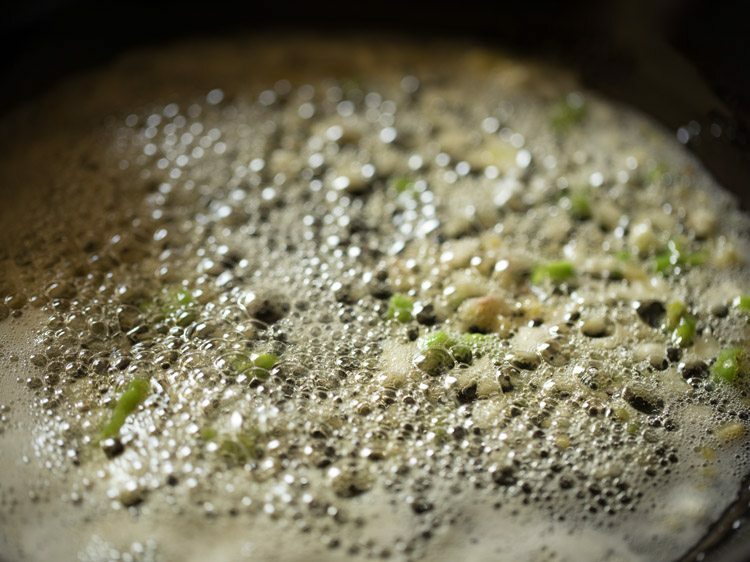 25. let the water come to a boil. 26. reduce the flame. then add the corn starch paste. stir the paste and then add as the corn starch settles down at the bottom of the bowl. 27. as soon as you add corn starch paste mix very well. in case you see lumps, then using a wired whisk stir and mix. stirring with wired whisk helps in breaking the lumps. 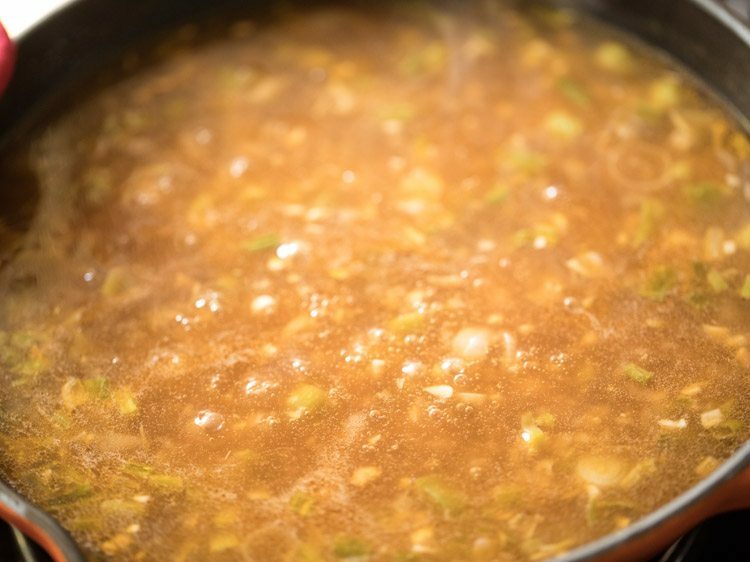 28. simmer on medium to high flame for 3 to 4 minutes. 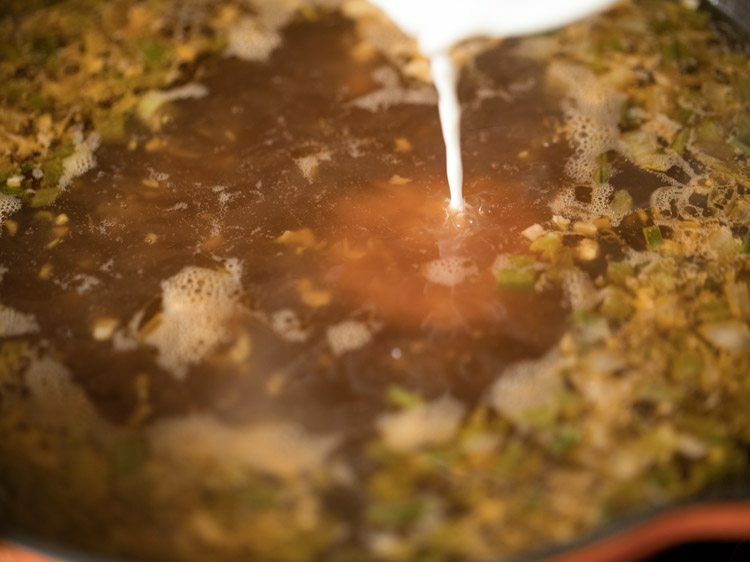 the sauce or gravy will also begin to thicken. 29. then add salt as per taste. 30. add ¼ teaspoon black pepper powder or as required. 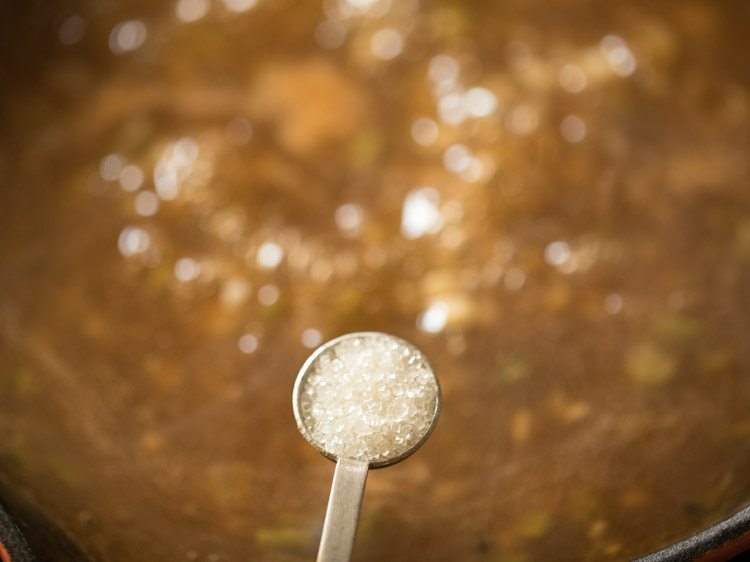 31. add ½ teaspoon sugar or as per taste. 32. mix very well. check the taste and add more salt, pepper, sugar or any of the sauces if required. 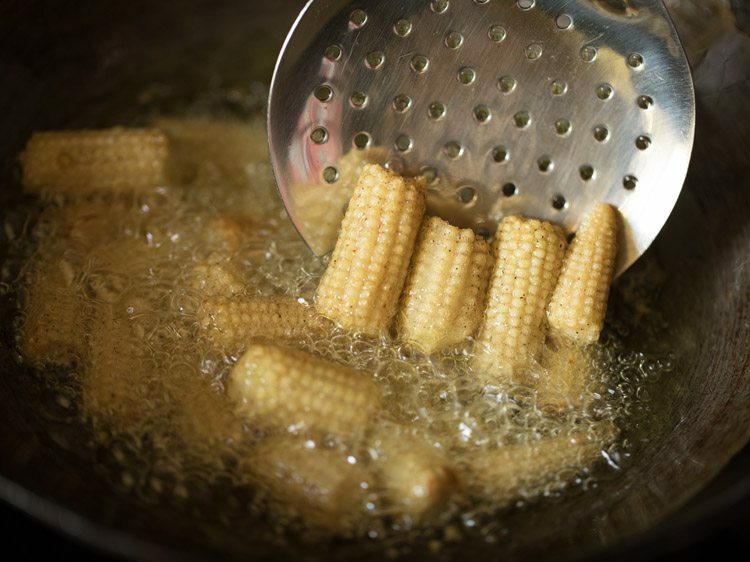 33. add the fried baby corn. 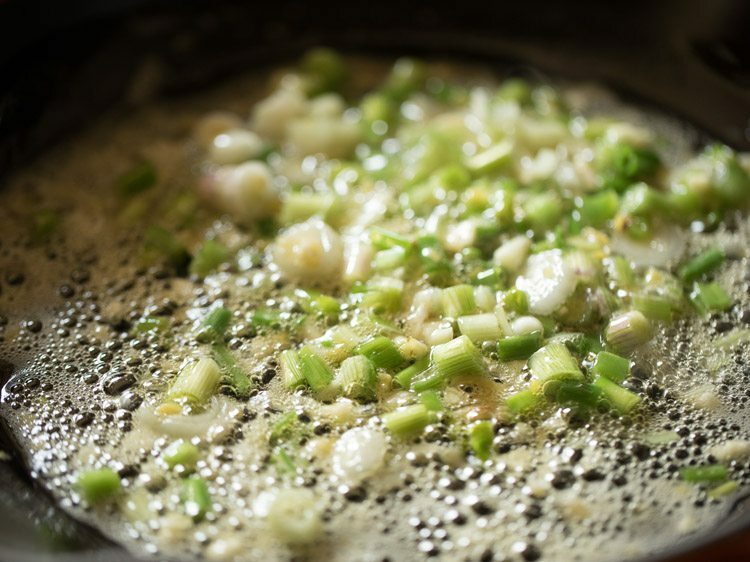 35. switch off the flame and add ¼ cup chopped spring onion greens. 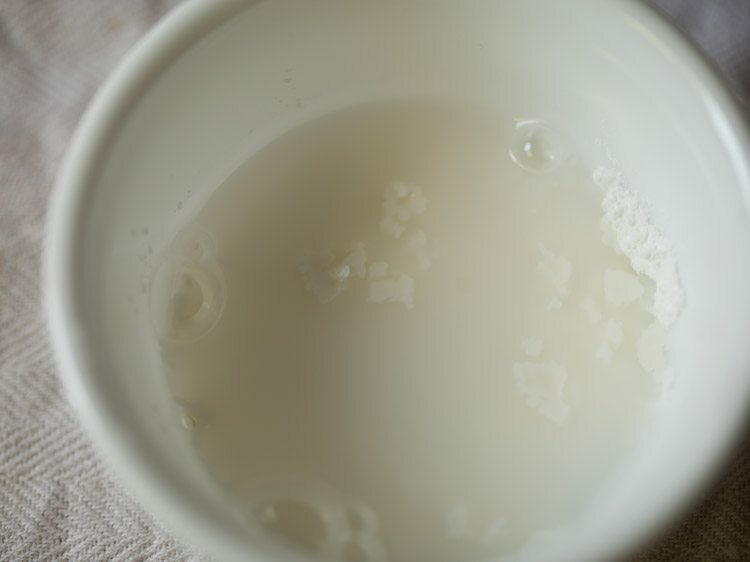 36. lastly add ½ teaspoon rice vinegar or white vinegar or apple cider vinegar. mix well. 37. garnish baby corn manchurian gravy with some chopped spring onions while serving. 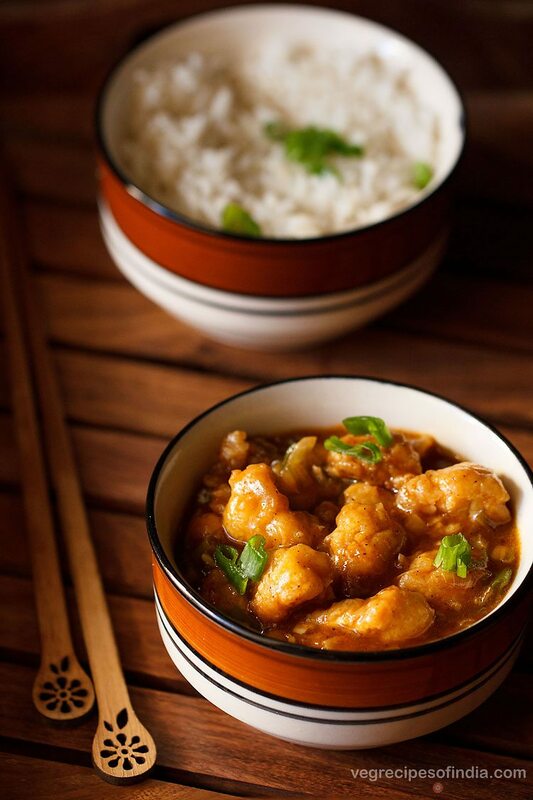 serve baby corn manchurian gravy with veg fried rice or jeera rice or veg noodles or plain steamed rice. you can also serve with chapatis or phulkas. 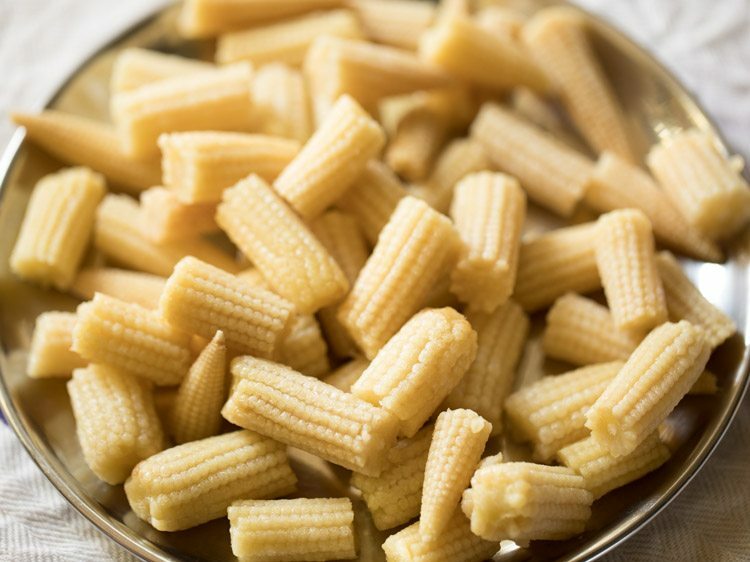 for more baby corn recipes you can check this collection of 12 baby corn recipes. How can I cancel this service please? Tony, its depends upon the browser you are using. You can search in google “how to stop push notification for your browser”. Or when you get the message “is there any settings icon you see in the pop up”. using that icon you can disable the notifications.